It's feet week - Go Fit Girl! | Go Fit Girl! Feet and other supplies are ready to go for Friday's yoga class. The theme for this week … is feet! I personally think feet are one of the ugliest parts of our bodies. I would say I have a foot unfettish. My feet are super ticklish. So I hate having them touched. Probably about six years ago I decided to treat myself to a mani/pedi. I had never had a pedicure before. I am now a regular of both the mani and the pedi. But I still go nuts when they do the foot scrubbie thing. Eeek. My REI gift card and moola went to these items: new yoga mat, yoga block and tank top. So many of us abuse our feet. We wear bad, unsafe, uncomfortable shoes. We stand for too long with bad or good shoes. We don’t wear the right shoes when we exercise. We don’t realize the care we really need to give our feet, which I think includes pedicures and massages. 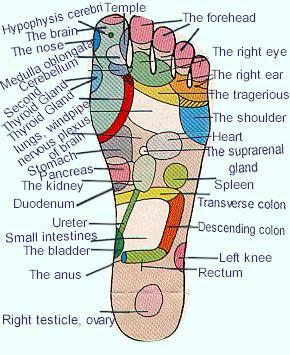 Our feet have so many pressures points that link to other parts of the body. It is truly amazing how much our feet can affect our health and wellness. « Who is Go Fit Girl! ?